By now nearly everyone has seen the story of the Blue Man that has appeared in the print and electronic mass media. The Blue Man story became a major media disinformation event which was produced by a public relations firm and paid for by a pharmaceutical interest. The purpose of this campaign was to scare the public away from using colloidal silver products. The tactic was to claim that the Blue Man's condition was caused by his use of colloidal silver thus implying that anyone who uses colloidal silver would suffer a similar fate. The entire story as presented is a study in fraudulent misrepresentation. The story is about Paul Karason who the media claimed turned blue from taking colloidal silver. The fact is that Paul has a condition called argyria that turns the skin a blue gray color that he got not by taking colloidal silver, but by taking a homemade silver compound that was mostly an ionic silver solution that he prepared while believing he was making colloidal silver. The following report was prepared by Marshall Dudley, a respected researcher in the field of colloidal silver. A silver compound will typically become silver chloride as soon as it hits the stomach. The silver chloride is sparingly soluble, about .8 ppm. The dissolved silver chloride will move into the bloodstream and once there will be exposed to chemicals that will induce the silver to plate out on any other silver particles present. However when silver compounds, such as silver chloride or silver nitrate are taken initially there will be no other silver particles present, so the silver chloride circulates in the blood until exposed to light in the skin, where they are photo reduced to silver atoms. This is the photographic process that occurs when you take a picture (with a film camera). Once the silver atoms are produced in the skin, then the rest of the silver chloride will begin reducing onto those particles making them grow very fast, and resulting in many of them getting stuck in the skin. Since the particles are so small, they will appear as black or blue, giving the skin a bluish cast. 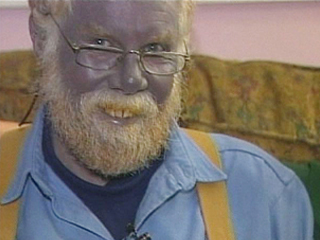 This is called argyria, and can result from taking silver compounds without any colloidal component. Applying silver compounds directly to the skin can increase the effect tremendously. This was dramatically demonstrated by Paul Karason who the news media has dubbed "The Blue Man". Although the news media has continually said that he was taking colloidal silver, nothing could be further from the truth. Interviews with him have determined that he not only was NOT taking colloidal silver, but was following a protocol that would almost certainly lead to his condition. He obviously did not read this report, since if he had, he surely would never have done what he did. First he was adding sea salt to his distilled water, and was not using any current limit. Thus what he was making was silver chloride, a silver compound well known to cause argyria, NOT colloidal silver. He had NO colloidal silver at all in his brew. Instead of being crystal clear, as properly made ionic silver is, he had so much silver chloride in it, that it looked more like milk than water. It is likely that he had 100 ppm of silver or more in his concoction, whereas 10 ppm is typical for normal CS. He did not limit current, or do any of the things necessary to make a good colloid. This is important, since argyria can only be expected when high levels of silver SALTS are taken. On top of that he applied it directly to his skin, effectively making his skin a photographic plate, and used tanning beds to "Fix" the silver in his skin. Researchers such as myself have been warning people about this for almost 10 years now, long before people started reporting the problem. Obviously he did not get the memo! I really don't think I could have come up with a better protocol to turn blue. It is almost identical to a method I had played with to produce tattoos by putting silver chloride on the skin, and exposing to light via a template to produce a blue tattoo. To see just what one can end up looking like if they ignore the information on the correct way to make colloidal silver, and use silver compounds instead, here is a picture of Paul. Remember, silver compounds are great for making photographic paper, not for taking internally or applying to the skin.